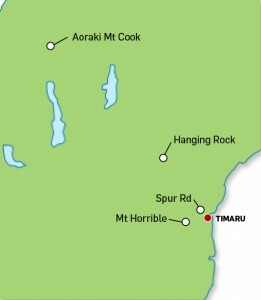 South Canterbury claims Aoraki Mount Cook National Park and all within, as its backyard. With a significant chunk of the Southern Alps and Main Divide within its reach, the region has fantastic access to the big hills. There are also several rock crags within spitting distance and skiing, both on and off-piste. Crag Climbing runs during summer from 6pm until dark starting at Spur Road. For all climbing nights please text Kelly 021 243 7381 to let her know if you wish to climb. Due to low numbers at climbing nights she will only be there if she has confirmation of your attendance. Anyone interested in the section or its activities can visit the regular section meetings at the Police Social Room, North Street, Timaru at 8pm, 2nd last Thursday of each month except December and January. South Canterbury are responsible for the Unwin Lodge maintenance programme. The section has a great range of books including instruction books, early Journals and the American Climbing magazines. There is also an Instruction Video on climbing techniques, knots etc. The section has ice axes, crampons, show shovels, avalanche transceivers, snowshoes, personal locator beacons, snowstakes for hire – contact Gary Brehaut +64 (0)3 688 9399.